This week was a good week, we finally got back into double figures. With two newcomers we made it to 11 people. I arrived to find some people already playing Munchkin. I'm not sure what variant it was, maybe zombies. This left seven of us so the only sensible plan of action was to play 7 Wonders. I started off slowly with neither me nor my neighbors having any wood or stone at all but in the third age I really lucked out getting a lot of free builds due to my previous cards. Dan and I went research crazy and both managed to get five of the same kind of symbol. I also managed to get one of each type of symbol too which edged my score above his, winning the game. 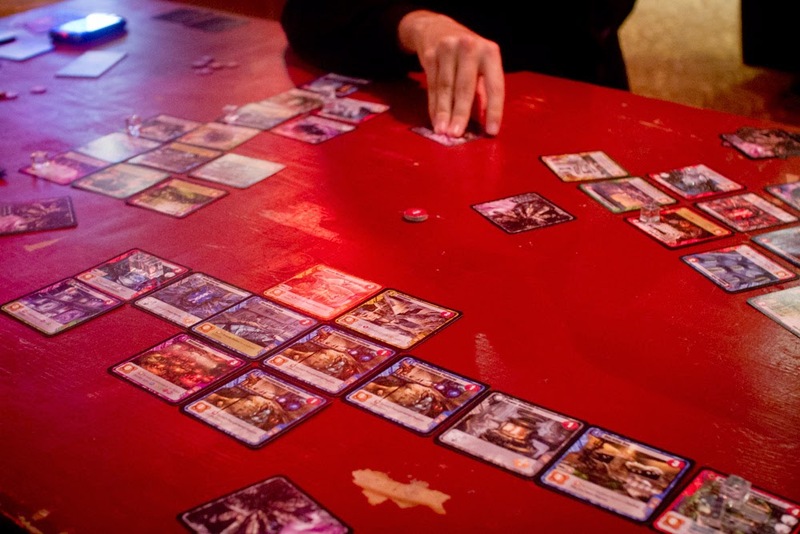 Often with 7 Wonders if only one or two people go for research you can score pretty highly but it's a risky move because if people catch on they can block you by discarding research cards or using them to build wonders. A few research of different types is nowhere near as good as lots of a single kind. After 7 wonders we split into three groups. 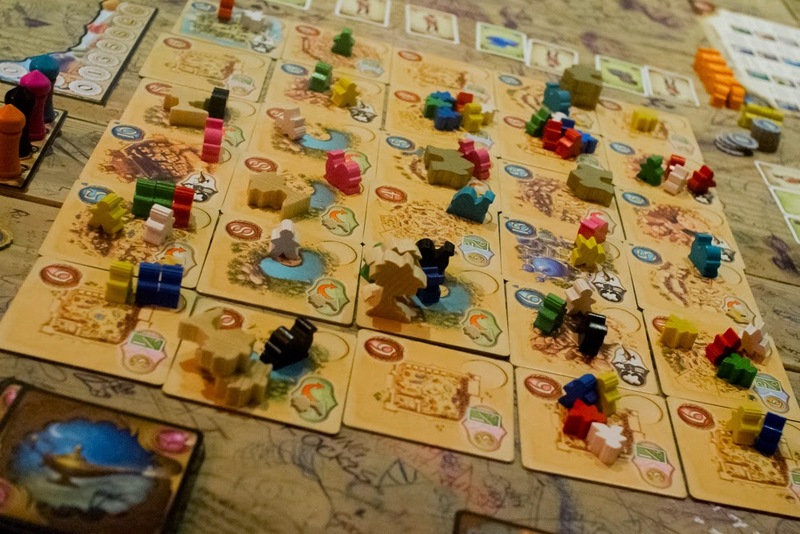 Alex played Five Tribes, Dan played Kemet and I played another drafting game, Among The Stars. Among The Stars is pretty much a space based 7 Wonders. That is space in theme where you're building a space station as well as space in mechanism where you're arranging cards spatially. In this game there are two types of cards, those that trigger immediately and those that trigger at the end of the game. Dan and I had played mostly immediate cards whereas Johnny had gone for a more delayed approach. Johnny was sure he was losing but when it came to the final scoring he'd beaten us by a mile. 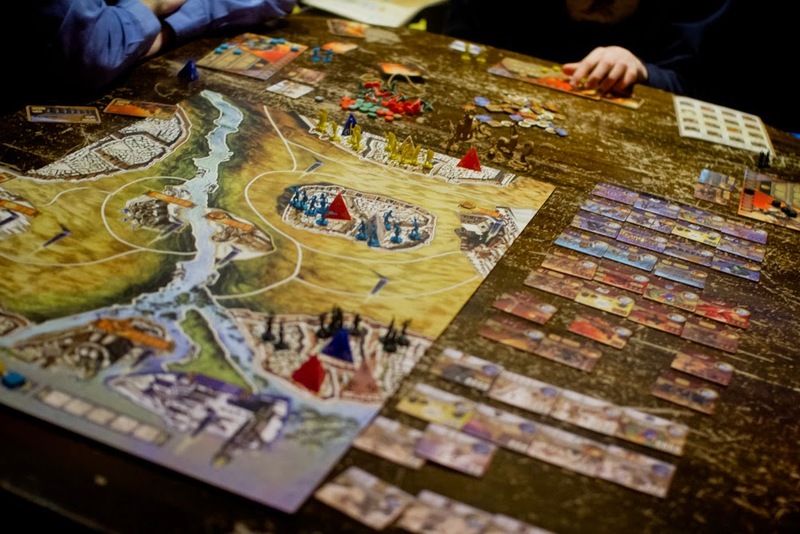 By the time we'd finished Among The Stars, Dan had already finished Kemet, a game that took us over two hours when I played it last. It seems Dan had devised a pretty decent strategy and made it to the victory condition in no time. Also there were less people playing it this time so that might have contributed. Alex had won Five Tribes and had finished up the same time as Dan. By the time we were done with 7 Wonders everyone else was just finishing a game of Coup. I taught a couple of guys how to play Yardmaster Express while the rest played Lost Legacy. Unfortunately I taught Yardmaster Express incorrectly. Instead of drawing a card, playing a card and passing your hand to the next player I taught it like a 7 Wonders/Among The Stars style drafting game where everyone would play their hand in unison. Luckily the game still worked pretty well for the most part. I guess that's what happens when you play too many drafting games in one night.